Fresh, organic chicken wings. Hard to better for flavour or welfare, short of raising chickens in your garden yourself. A winner at parties – marinate in spices, then bake or barbecue. Or coat in breadcrumbs then deep fry, for perfect finger-licking outdoors eating. Serves 5. 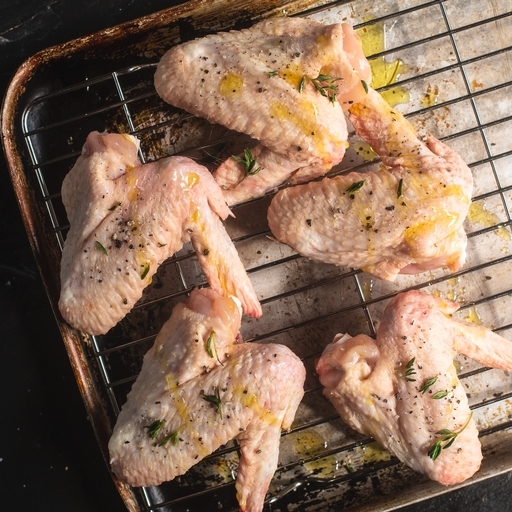 To simply roast the wings in the oven: preheat your oven to 180°C/Gas 4, season well on both sides, sit on a wire rack above a tray and roast for 30-40 mins until the skin is crisp and golden. Rest for at least 5 mins before serving. They’ll take less time on a hot BBQ - 20 mins or so. They are a perfect vehicle for sauces or marinades but often need to cook for a little longer, depending on the recipe.